Iris Wagstaff spent 15 years as an analytical research chemist. Now she’s trying to lead others into promising STEM careers. Wagstaff grew up in North Carolina, studied chemistry at the University of North Carolina at Greensboro and North Carolina A&T State University. But after taking a job at Dow Chemical, she started coaching science teachers and coming up with her own teaching aids to get students interested in science. 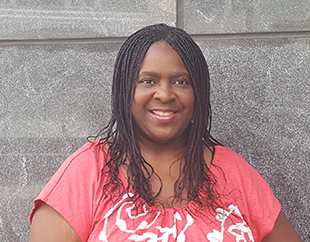 Her own interest eventually led her to return to school for a science education doctorate, and then to AAAS — first as a Science and Technology Policy Fellow at the National Institute of Justice, the research arm of the Justice Department; and since March 2017, as STEM Program Director in the Education and Human Resources (EHR) Division. In both jobs, she’s worked to boost diversity and inclusion in the sciences and to bolster support for science, technology, engineering and mathematics education. What drew you to chemistry, and then to education? I was not one of those people who was only interested in science. I always loved science — I was always taking things apart and interested in how things worked. But I was also heavily involved in the arts, politics, and student government. I’ve been a community activist at heart my whole life, science just happens to be my vehicle for advocacy. In 11th grade, when I took AP chemistry, I was like, “Yes, this is it for me,” because I hated biology. I wanted nothing to do with living things or nature or any of that. But chemistry really clicked for me because it explained how the world works on a molecular level. I could actually see reactions and electrons moving in my head. I went on to get a bachelor’s and master’s in chemistry. I worked at Dow Chemical for 15 years as a research chemist, where I led analytical project teams to solve customer problems for customers like Sherwin Williams, whose paint was based on our specialty chemicals. But throughout my career, I’ve been heavily involved in outreach in the community. For 25 years, I’ve been developing informal science programs, resourcing parents, and working with science teachers to develop culturally relevant curricula that help students connect the science they learn in the classroom to their everyday lives. I actually left the chemical industry and a career that I loved, in 2007, to go back to North Carolina to care for my mom. When she passed in 2008, I decided to start all over by formally pursuing what I have been doing on a volunteer basis for so many years — STEM education. My science education program at NC State prepared me for the role I am in now by becoming well-versed in the STEM education literature and conducting research focused on issues related to broadening participation in STEM, and the preparation and support of pre-service and in-service STEM teachers in underserved areas. How did you get involved in mentoring students? I’ve been volunteering with students doing hands-on science activities since I was an undergraduate in college. The volunteering became more formalized into a mentoring role as part of my involvement with my professional societies like the American Chemical Society and the National Organization of Black Chemists and Chemical Engineers. Through these organizations, I developed mentoring and outreach initiatives, and served as the Education Committee Chair. It’s always a treat to see the students that I have mentored at the annual conferences each year — many of whom have gone on to complete their Ph.D. and have successful STEM careers. How did that involvement change your perspective? Mentoring students at the undergraduate and graduate levels reinforced for me the need for STEM professionals to take an active role in preparing the next generation. It also highlighted the gaps in scientific and technical degree programs that do not prepare students with the professional development skills that they need to be successful, such as how to find a mentor, strategic networking, and career advancement. My work with K-12 science teachers over the years revealed some of the challenges and barriers they face daily. I didn’t realize until I went back to graduate school in education that many math and science teachers don’t have math and science degrees. This doesn’t mean they are not qualified, but it does suggest an opportunity for STEM content experts to work collaboratively with teachers to develop engaging lessons that embed STEM career awareness. One of our programs in EHR is the STEM Volunteers Program that addresses this very issue by matching local teaches in the DMV [Washington, D.C., metropolitan area] with current and retired STEM professionals. The whole issue of better preparing and supporting STEM teachers is what our department at EHR does a lot of — giving them the resources and tools to equip students with the skills they need for the jobs of the future. We recently convened the NSF Noyce Summit that focuses on enhancing STEM teacher preparation and advancing the scholarship in this area with regards to innovations and best practices. Our Science NetLinks initiative provides online teaching tools and resources for K-12 teachers, students and parents, and our GSK Science in the Summer Program, which is going on now, is a free science education program for elementary students conducted at community centers and libraries across the DMV to keep students engaged over the summer. You’ve been involved in STEM recruitment for a while. What changes have you seen in that time? As far as moving the needle, not a lot unfortunately. Over the last 10 years we have seen more awareness of the need to cultivate a diverse STEM workforce, and there has been some alignment of federal mandates for broadening participation with global economic competitiveness initiatives. For women in science, we continue to see the largest representation in the life and social sciences, but the physical sciences, engineering, and computer science fields remain stagnate — and in some cases, have regressed with respect to both women and minorities. Recruitment of persons with disabilities into STEM fields remained largely unchanged. Where are the remaining gaps, and how do we address them? At the K-12 level there continues to be a gap in the recruitment, preparation and retention of highly qualified STEM teachers. For students, particularly those who are underrepresented or underserved, there continues to be inequity with respect to access to quality STEM education and viable pathways to STEM majors. Additionally, low expectations, a lack of confidence and encouragement in STEM continue to pose challenges. And to complicate the issues more, the acronym STEM has been a buzzword for the last two decades, but there is still some debate on how to best integrate these four subjects across courses by breaking down the structural teaching silos in many school districts. The ultimate goal of STEM education isn’t necessarily to produce STEM professionals for the job sector. It is to produce scientifically literate citizens, regardless of their career choice. The benefit of STEM education is that it embeds skills like critical thinking and problem-solving, which are important for an informed and productive citizenry. At the higher education level, after K-12 students have entered STEM majors, many of them don’t get the faculty support, mentoring, and non-technical skills that they need to complete graduation. These challenges are compounded for many minority and female students who routinely report feeling isolated and discouraged from STEM degree completion. We can address these issues by providing viable and accessible pathways to STEM majors and careers, and by better preparing and retaining STEM teachers. For academe, there has to be a culture change to incentivize faculty to take the lead in creating environments where students flourish in STEM majors. Faculty can often act as “gatekeepers” to the STEM degree. If they are resistant to adopting teaching strategies and best practices that we know support students, it is unlikely that we will see the systemic and structural changes required to move the needle. We can also provide programmatic support, resources, and mentoring across all levels of STEM education that help students develop a science identity and confidence in STEM at early ages. How does what you’re doing now at the university level differ from the work you did with K-12 programs? My portfolio at AAAS includes undergraduate, graduate and post-doctoral programs focused on STEM workforce development and broadening participation. I manage the Emerging Researchers National Conference in STEM. That is funded by NSF and administered by AAAS. This yearly conference provides undergraduate and graduate STEM majors an opportunity to come present their research. We provide travel awards, and they present their research as a poster or an oral presentation. It’s also an opportunity for them to engage in professional development and learn about educational and career opportunities. The focus of the conference is to better prepare students for a global STEM workforce. I also manage the L’Oreal For Women in Science post-doctoral fellowship. It provides five female scientists $60,000 to support their post-doctoral research. This Fellowship is a research workforce development initiative in that many of the Fellows go on to faculty research positions. A goal of the Fellowship for L’Oreal is also to bring attention to and highlight the need to support women in science by allowing a portion of the funds to be allotted for outreach efforts. Do you ever miss the lab? I do. I never would have left the chemical industry if my mom had not taken ill, because I loved it. The transition from chemistry to education was huge for me. It’s a very different world, a different way of writing and thinking and talking. My training in educational research, evaluation, and science pedagogy has given me the expertise and opportunity to address the issues that are dear to my heart such as broadening participation in STEM as more than solely a chemistry content expert. I don’t know too many people that are research chemists and social scientists. Adding the policy component via my [Science & Technology Policy] Fellowship and now my work in EHR, has really rounded out my career trajectory. I’m so honored to be working alongside my colleagues in EHR. They inspire me every day in the work that they do and the many areas of expertise in our Unit. AAAS has been a great landing place for my non-linear educational and career journey.